My High-Sider Litter “Box” is a BOX, yes a corrugated WAX saturated cardboard litter “box”… I can’t lie, I can’t come up with some fancy “other name” for what the litter “box” is made out of… so, it is what it is. The new custom designed litter box, (23 inches long x 13 inches wide and 15 inches tall – no more “missing” over the edge) fits in my Out of Sight Litter Box cabinet (ordered 2015 on). 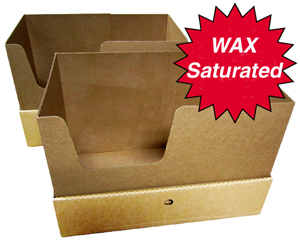 The wax saturated cardboard is moisture resistant, the walls (sides) and the bottom (insert) are both wax saturated, the tray is wax coated on the inside. My High-Sider™ litter box assembles easily, and the three layers overlap into a leak proof system. I like it better than any of the plastic ones I’ve ever used! The bottom is flat, and the walls 90 degrees vertical. These replacements are sold in pairs. I have 4 cats that tested one litter box, and it was in great shape after six months use, if you only have one cat… that would equate to lasting more than one year. It works! No smells. No leaks. No problems. The High-Sider™ Litter Box is great for multi-cat households. Also great to use as a stand alone litter box (with no cabinet) while traveling. Note: These litter boxes are too large and DO NOT fit in my older (smaller) cabinets ordered before 2013.